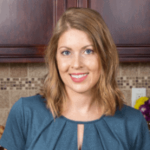 Published: Dec 5, 2016 · Modified: Apr 12, 2019 · By Jen Sobjack · This post may contain affiliate links. 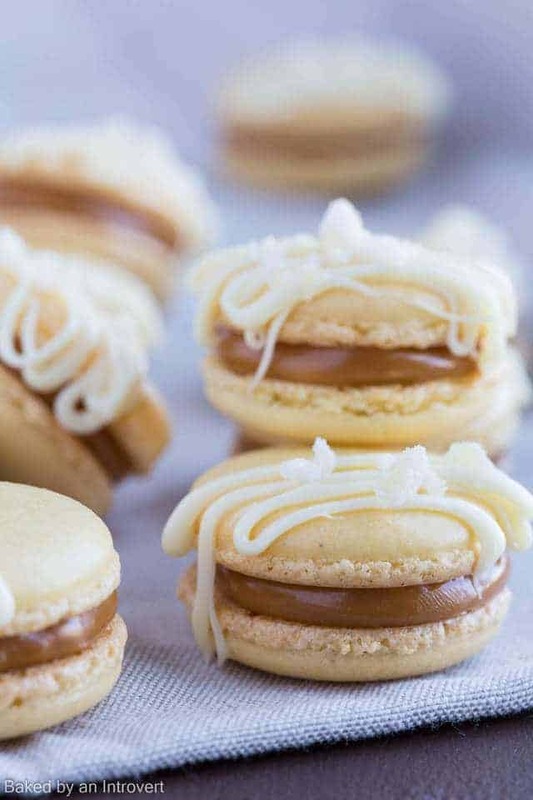 Salted Caramel Ginger Macarons are the perfect little treat. These macarons, in particular, might be the prettiest ones I’ve ever made. They look just like the ones in a fancy bakery. 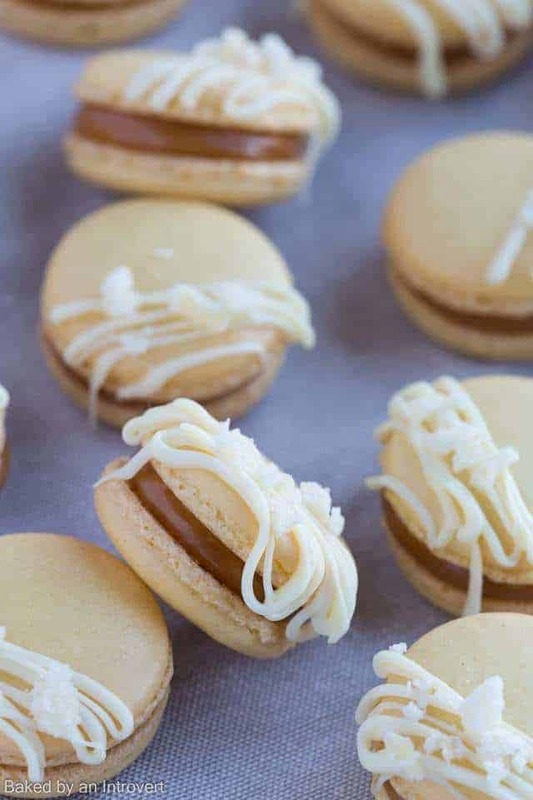 The caramel filling in this macaron recipe is the easiest you will ever make because it only requires melting soft caramel candies. The macaron shells are flavored with ground ginger and they meld perfectly with the gooey caramel. Your friends and family will be thrilled to see these macarons on the dessert table! Macarons can be finicky but the end result is so worth it. Remember these Easter cheesecake macarons? They were my favorite up until now. Make sure you read through my post on how to make French Macarons before beginning today’s recipe. There are several helpful tips and tricks available in that post to help ensure your macarons come out perfect every time. The delicate macaron shells are flavored with ground ginger. The shells alone are so tasty! I colored the shells with yellow gel food coloring but this is completely optional. The caramel filling is the easiest of all because all you need to do is warm caramel bits or soft caramel candies in a saucepan with a little cream until it’s melted and smooth. Transfer it to a piping bag and pipe small dollops onto one cookie and sandwich another over the top. I sprinkled a small amount of sea salt over the caramel before adding the second macaron shell. I decorated the tops of each cookie with a drizzle of white chocolate and a few pieces of crystallized ginger. This is completely optional but I think they look rather cute this way. You’ll need to chop the crystallized ginger into tiny pieces and sprinkle it over the white chocolate before it sets. The white chocolate will act as “glue”, keeping the ginger from falling off. 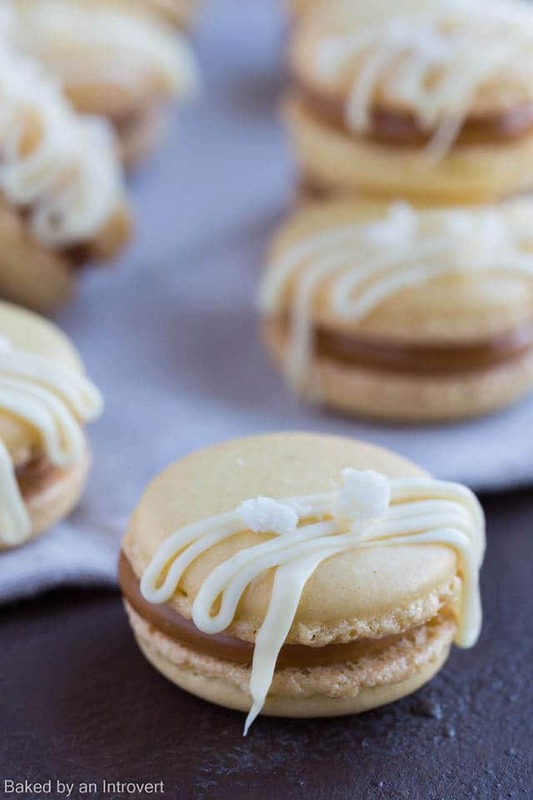 Serve these salted caramel ginger macarons at your next holiday party and everyone will think you purchased them at a high-end bakery! Salted Caramel Ginger Macarons are the perfect little treat. These macarons, in particular, might be the prettiest ones I’ve ever made. They look just like the ones in a fancy bakery. 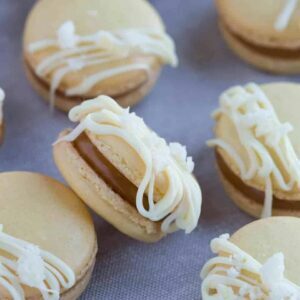 The caramel filling in this macaron recipe is the easiest you will ever make because it only requires melting soft caramel candies. The macaron shells are flavored with ground ginger and they meld perfectly with the gooey caramel. Your friends and family will be thrilled to see these macarons on the dessert table! In the bowl of a stand mixer fitted with the whisk attachment, whip the egg whites and salt on medium speed until frothy. Gradually add the granulated sugar. Turn the speed up to medium-high and whip until soft peaks form. Add the food coloring and whip until stiff peaks form. Take extra care to not over whip. Sift the almond flour mixture into the whipped egg whites in three separate additions, folding only 3 to 4 times after each addition. After the final addition, fold until batter becomes thick and smooth. When folding, cut through the meringue and then fold up and over. Scrape the sides and turn the bowl as you go. Let the batter sit for 20 minutes. Meanwhile, line 2 large baking sheets with silicone mats and fit a large piping bag with a 1/2-inch tip. Twist the bag right above the tip and tuck it down inside the tip. This will prevent the batter from leaking out as you fill the bag. Fill the pastry bag with the batter, be as gentle as you can with the process. Try not to overwork the batter. Pipe 1 to 2-inch rounds onto the prepared baking sheets. Gently tap the baking sheet on the counter top to bring any air bubbles to the surface. Use a wooden toothpick to pop the bubbles. Let the macarons sit for 45 to 60 minutes, until a thick, dry skin forms on the surface. They should not feel sticky to the touch when going into the oven. Meanwhile, adjust the oven rack to the center of the oven and preheat the to 300ºF. Bake one sheet of cookies at a time for about 15 to 18 minutes, rotating halfway through. The macarons are done when you can just barely separate the shells from the silicone mat. The cookies will brown slightly. If the bottoms begin to get too brown place a second cookie sheet underneath. If the cookies turn brown too quickly, use a wooden spoon to prop the oven door open just a tad. Cool the shells completely on the baking sheet set on a wire rack. Do not attempt to remove the shells from the silicone mat until they are completely cooled or they may stick and break off. Heat the caramels and cream in a small saucepan over low heat, stirring constantly until melted and smooth. Let the caramel cool until it no longer burns to the touch. Transfer the caramel to a sandwich bag and cut off a tiny bit of the bottom corner. Squeeze a small about into the bottom center of one cookie, don’t go all the way to the rim. Sprinkle sea salt over the caramel. If the sea salt doesn’t stick to the caramel, try dipping the caramel lightly in the sea salt and gently tap off an excess. Place an equal size cookie on top to sandwich the filling. Repeat with remaining cookies and caramel. Place the white chocolate in a small microwave-safe bowl. Heat in 15-second intervals, stirring well between each one until the chocolate is fully melted and smooth. Drizzle the melted chocolate over half of each filled macaron. Sprinkle a few pieces of the candied ginger over the white chocolate before it sets. Store the macarons in the refrigerator for at least one day and bring them to room temperature just before serving. They taste the best this way. Omg I’m drooling for these! I was thinking to fill them with dulce de leche too. That is a fabulous idea!! Can you activate the video for viewing? I’m not sure what you mean. The video is visible. If you are on desktop, it will be at the very top of the post and it will jump to the side as you scroll down the page. If you are on mobile, it’s down in the recipe card under the “recipe video” heading. Yummy! This is lovely, I should try it out! Salted caramel and ginger sound like such wonderful flavors for macarons! Yum! These macaroons look heavenly! I’ve got to make them ASAP. So pretty! Whoa. I think you need to open your own pastry shop. I’d be a regular customer!! I seriously can’t believe the intricate desserts that you churn out on a regular basis. So impressive! And these might just be one of my favorites. Love the addition of the salt!